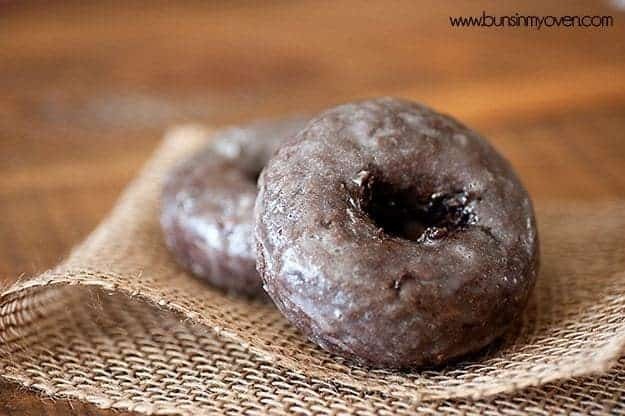 These glazed chocolate donuts are soft and moist and dipped in a sweet glaze! So, I set my mind to it and I measured and mixed and baked and tasted and then did it again and again quite a few times. Finally, I came up with this recipe. The perfect chocolate donut. It’s moist. It’s fluffy. It’s like a chocolate cake, but it’s shaped like a donut which means that it’s breakfast. Then I dunked the donuts in my favorite donut glaze. It gets all crisp and crackly and is pretty much just as perfect as the donut shop glaze. These are definitely my favorite baked donuts! 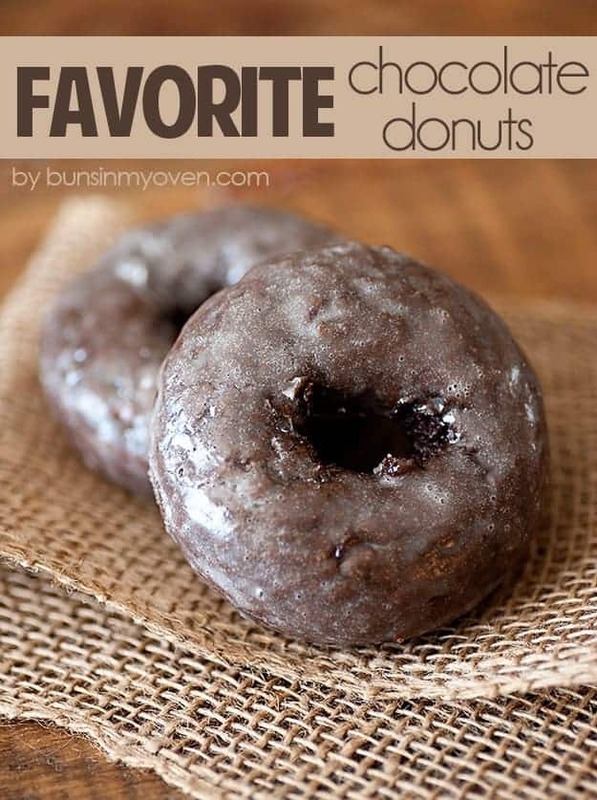 If you prefer fried donuts, be sure to check out my favorite recipe for those here! , this is the one. No mixer needed and it takes less than 20 minutes to get your donuts on the table. 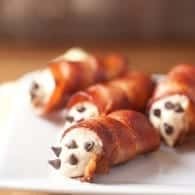 These make a great after school snack, too. Whisk together the powdered sugar, milk, and vanilla until smooth. Dunk the donuts in the glaze to fully coat and place on a wire rack to set, about 5 minutes. These looked great and I was excited about the recipe, but they just didn’t taste like a doughnut to me. Even though it’s a baked cake doughnut, it had the light, spongy texture of a cake, not the firm density of a chocolate doughnut. The only substitutions I made because I didn’t have the ingredients were plain yogurt for sour cream and corn oil for regular vegetable oil. I don’t think these were significant enough to mes with the taste. These were just lacking in flavor. They came out looking nice though. Thanks for the opportunity to try it. These just weren’t for me. Gina, my thoughts exactly. These aren’t dense, cakey, gut-quenching doughnuts; they’re light, airy muffins that are attending a costume party. They definitely look the part, but that’s as far as the comparison goes. These will not realistically satisfy anyone’s doughnut craving… Sadly. I can’t believe the negative comments. I thought they were the bomb!!!!! And so did my friends that also ate them. I used this recipe in my first batch of donuts baked in Babycakes treatmaker. Each batch was done in 5 Min and tasted EXACTLY like a fresh chocolate donut! AMAZING! PLUS I used GF flour and almond milk to make them gluten and dairy free! I read through the reviews before making these and a few noted that the flavor was underwhelming so I added 1/4 tsp salt, 1/2 tbsp instant espresso, 1/2 tsp cinnamon, 1/4 tsp cardamom, 1/4 tsp nutmeg and 1/8 tsp ginger for a “chai” version. The donuts themselves are delicious but I had trouble with the glaze not setting so they’re really sticky to handle, which is disappointing. 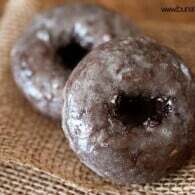 I’ve made hard chocolate glazes for donuts before and have never had a problem. The glaze was very foamy….is it supposed to be? My glaze turned out great. All I had was almond milk, but it worked. My glaze didn’t set up either, but I didn’t have whole milk. I used 2% instead since that’s what I had. Could that be the reason? I’m honestly not sure why some people are having problems with the glaze. It could have been the milk. The milk does not matter… if you simply warm the milk first to just below boiling and then whisk in the powdered sugar and remaining ingredients, it will set. If you wanted it to set up really tight, you can cook the entire recipe over a double boiler…the higher you take the temp the harder the sugar will set (just like when cooking sugar to different stages, except its not necessary to cook that high. Actually if you allowed the donuts to sit out at room temp long enough they would dry on their own without heating, but the heating is instant. thanks for the recipe. it was yummy! These donuts are the BOMB!!! The best donuts I’ve ever made!!! They were so moist and chocolatey. I dipped them in chocolate ganache instead of the glaze. Incredible!! Can i freeze these after glazing. I need things to make ahead. I’m not sure – I’ve never tried it. Not sure how well the glaze will hold up, but if you try please report back! I have frozen some and when they defrost the glaze is absorbed into the doughnut like a sponge. I wouldn’t recommend freezing them. Ooh, good to know! Maybe best to freeze before glazing. Just tried them and we love them! We used our mini cupcake maker since I don’t have a donut pan (it’s on my Christmas list ;)). So they ended up being like donut holes. I was craving chocolate donuts and these took care of the craving thank you! Can you use this recipe and a donut maker. I’ve got my child a babycakes donut maker for Christmas and I’m looking for a good chocolate donut recipe. **Can you use this recipe in a donut maker. I got my child a babycakes donut maker for Christmas and I’m looking for a good chocolate doughnut recipe. I used a Babycakes donut hole/cakepop maker and these took 4 minutes. I read many of the comments and was a bit hesitant about making these donuts after that, but I had bought the ingredients…… THEY ARE AMAZING. The texture was great. They are chocolately but not overly sweet (without the glaze) and moist and rich. Since my boyfriend declared he wasn’t all that interested in eating them I decided to go with an espresso glaze instead which pushed these from the realm of amazing into OUT OF THIS WORLD. Likely, you didn’t add salt because she doesn’t mention when to add it in the instructions! Is it possible to make this batter the night before so they can just be thrown together in the morning? I’ve never attempted this. I’d be worried that the donuts wouldn’t rise as well. Can you take a video of you making the donuts Please. Its because it will be easier for me and others to make the donuts. Fantastic donuts….though I was out of Sour Cream…I replaced it with an extra 1/4 cup milk and 3 tablespoons of cream cheese. The best donuts I have ever made…can’t understand the critique. I am going to play around with some of the coffee and other flavors…thanks. They were super moist…maybe a cross between a cupcake and donuts ….or cupnuts, doncakes?? Anyway…all were gone in minutes and took no time. THANKS! Can I substitute with yogurt for sour cream as it is not available in our country. Sure thing! I would recommend Greek yogurt if it’s available. Your donuts were delicious! I used Greek yogurt for the sour cream and for half of the oil. They turned out so light and soft. My husband isn’t a healthy eating person and he thought they were pretty good. We decided that next time we would only glaze the top. They were a little too sweet totally dunked. What is the best way to store these if I won’t be eating all of them at once? They’ll keep fine covered, at room temp, for a few days. Absolutely loved the way these turned out! When they were still hot in the pan from the oven I gave the tops a quick spray of Pam and then sprinkled them with sugar–in my case it happened to be a Splenda/sugar mixture. They looked perfect. After the donuts cooled in the pan, I took them out and thoroughly enjoyed one. Or two. ^_^ Thanks for a terrific recipe! Just made them and they turned out AMAZING!!! I made them exactly to the recipe no changes. Loved them! We made these with our homeschool baking group yesterday and OMG they were delicious!!! I made these with the help of my daughters and they came out great! Not too sweet and they loved them! Unfortunately, it’s more just a cake that’s shaped like a donut. Lacks donut texture. Yes, they are lighter than typical cake donuts, but we thought the flavor and texture was delicious, so absolutely no complaints. Because I read the comments after they were in the oven, but before I glazed, I was concerned about them being chocolate enough and decided to use the glaze Terri posted (minus the corn syrup) and using 3 tsp espresso powder (instead of her 5) and 2 tsps cocoa powder. So very good! 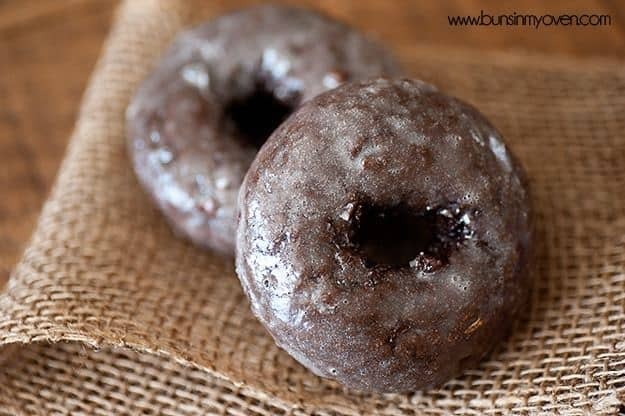 They might could be made as buntlettes (these are becoming popular) if some are opposed to calling them donuts. I say, “Yum” and thank you! MAde the recipe right before the kids got home from school. They were allowed to have a taste, but oddly enough they were all gone before I could ask, so do you like this new recipe? Needless to say, I will have to make more. I make these every week! My husband just loves them! Really glad I found the recipe! I actually put the Mic into a baggy and then it goes in the donut pan so even because I was surprised at how much they rise!! 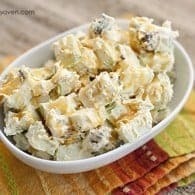 One of the best recipes I have ever found! Thank you so much! I put the Mix sorry about That, posting from my phone and it’s so tiny to read! Glad you enjoy these! 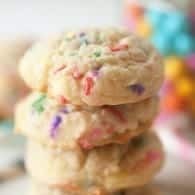 Adding the batter to a baggy sounds like a great idea! 8pm pregnancy craving for donuts and so I tried this recipe out. Delicious!! Just an FYI no where in the instructions says salt but it does in the ingredients. I always put my ingredients back away so I don’t miss adding anything. I was left with salt so I added it to my dry anyways. 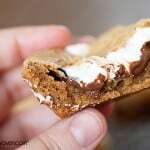 I tried out this recipe and they were good! To me, they have a texture combo of a doughnut and a muffin (which is perfect because I don’t have a doughnut pan, so I used a muffin pan instead!). Light and fluffy, which I love, and it isn’t too overly sweet. This was the first recipe I used to bake from scratch instead of out of a box, and I do not regret making it (though I do regret forgetting to grease the muffin pan). Thank you for sharing it! These are great! In lieu of chocolate chips, I doubled the cocoa powder (used raw cacao), and used avocado oil for the vegetable oil. I didn’t have a donut pan so I put balls of dough on a cookie sheet. They still had the consistency of a good cake donut and the glaze helped it to look and taste more doughnutty. Very yummy, thanks for sharing. Very nice doughnut-shaped cupcakes. Definitely not doughnut-like. Not worth the effort. I thought they were a waste of time. All those fattening ingredients and the end result was no flavor. Folks, keep looking. This isn’t the perfect donut recipe. It does not say SALT in the order that it should. Otherwise, my dream doughnut! How can I make this without a doughnut pan? You could just bake them as muffins instead.